The season finale of Emerald City definitely gave us some mixed emotions. “No Place Like Home” reeled us in with its boldness and unpredictability, but left us with more questions than answers. Last week, we left off with Tip/Ozma entering full-on princess mode with the intention of seizing back Oz. As Ozma, West, and their witch army storm the city, they meet little resistance from the magic-lacking army. Ozma then comes face-to-face with the cowardly lion warrior, Eamonn, who surrenders to the princess. Ozma clearly still holds a grudge and banishes Eamonn from Oz after she erases all memories his family had of him. With Eamonn gone and the army defeated, Ozma takes the throne of Emerald City. Elsewhere, things aren’t going as smoothly. Enraged by the Queen Ev situation, Jack storms toward the Wizard’s camp set up on the outskirts of Ev. After somehow getting past the Wizard’s entire army, Jack attacks the Wizard and almost kills him until Jane intervenes. The Wizard begins begging for his life and tells Jane that her daughter is here in Oz, thus revealing that Karen Chapman wasn’t Dorothy’s mother, Jane is. The camp is then attacked by Glinda and her witches. Luckily, Dorothy uses her magic abilities to keep the witches at bay. Glinda tries to reason with Dorothy and explains to her that she has chosen the wrong side, but all Dorothy wants is the Wizard to get her home. Glinda then has Sylvie use her magic to destroy the stone giant. Out of nowhere, the Wizard appears and shoots Sylvie which sparks a full-on battle. The use of magic causes a chaotic dust storm, but the soldiers open fire on the witches anyway. In the confusion, Jack is shot, stabbed, and torn apart by the soldiers. As the battle comes to a close, the witches are left dead on the ground. That is until they come back to life. It seems the Wizard forgot that only a witch can kill a witch. He is left defeated and Dorothy takes him prisoner. Meanwhile, the witches storm the castle and are surprised to find Ozma on the throne. Despite Glinda and West’s quarrels in the past, they come together and prepare to face the Beast Forever. Now that Dorothy has the Wizard, she demands him to start up his machine and send them home. The Wizard has a bit of a melt-down and refuses to go back because there is nothing for him in that world. As his anger grows, he attempts to strike Dorothy, but Jane arrives just in the knick of time and shoots him dead. Jane then explains to a very confused Dorothy that she his her real mother, and starts up the machine to send them home. Jane then tricks Dorothy into the chamber but doesn’t follow, claiming she is doing it to protect her. Dorothy is then sent into the vortex and crash lands to Kansas at the exact time she left. A lot went down in the finale and although it started out a bit melodramatic, it ended on a unique and suspenseful note. The cliff-hangers proved to be the best and worst part of the episode. So many important questions were left unanswered. What happened to Jack? How was Dorothy able to kill a witch? Why is Jane in prison? Most importantly, what was up with the Beast Forever and what was the outcome? I predicted that the season would end with a stereotypical action-packed battle against the mysterious Beast Forever, and that Ozma would then retake the throne from the witless Wizard and live happily ever after. Refreshingly, this didn’t happen, or maybe it did. The fact that Dorothy returned just before the climactic clash means that we will never know what really happened in Oz unless there is another season, which has yet to be determined. Emerald City started out promising, but fell short in delivering all that it seemed to have promised. The script itself was cheesy and mediocre at best, and lacked the substance and depth that it clearly wanted to achieve. Nevertheless, Emerald City was able to make up for these flaws due to its sheer entertainment value. It was visually stunning, thanks to its beautiful filming locations and exquisite costuming. The acting was also pretty impressive considering what they had to work with. The Wizard proved to be disappointing from start to finish. His performance was unconvincing and his death sparked little emotion. I believe Emerald City would have immensely benefited from casting another Wizard. It was an important and complex character that was dumbed down and made laughable. Even his meltdown before his death was hard to watch, and not in a good way. 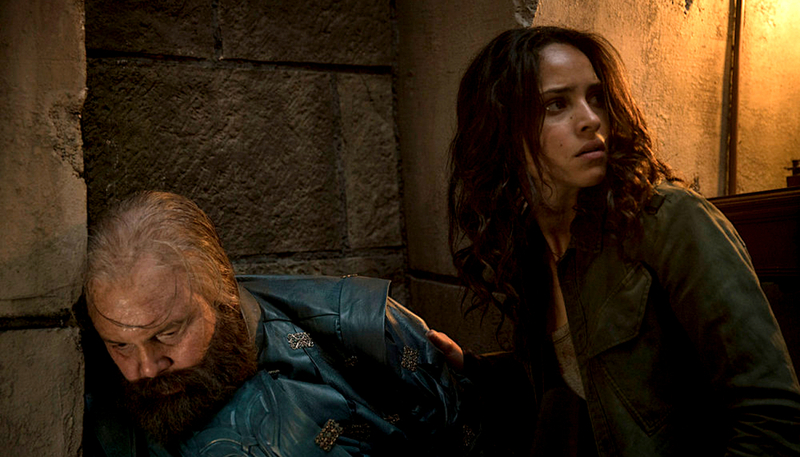 All in all, Emerald City was a pleasing family drama with some freaky flare. From a big-picture perspective, it was suspenseful, exciting, and teased us with juicy reveals. Although some of its deeper meanings and complexities were lost throughout the season, Emerald City left us amused and eager to know more. Though I don’t think it will be winning Emmy’s anytime soon, it did leave us entertained and hopeful for a second season. Emerald City Season 1 Finale Review: "No Place Like Home"
Anna is a twenty-one year old student residing in Columbus, Ohio. She is currently attending The Ohio State University and is studying Communications and Film Studies. She spends her free time binge-watching the Recently Addeds and binge-drinking wine while doing so. She worships David Fincher, Paul Newman and her cat Stella. Anna moonlights as a writer primarily because her friends got sick of her talking about film and TV constantly. Her hobbies include stalking celebrities online and getting overly competitive while playing board games. Previous ArticleSleepy Hollow 4x09 Review: "Child's Play"